Why are the Abacha's still lauded in Nigeria with all the money Abacha stole? Now with all these happening,Sani Abacha still has streets named after him in Nigeria! Are we mad in that country or just stupid? I really can't get my head round this.Any other country,ABACHA'S NAME WILL BE A TABOO.HE WILL HAVE BEEN STRIPPED OF EVERYTHING THAT EXALTS HIM.But not in Nigeria.With all these evidence,Buhari even once said Abacha was not corrupt.Hellooooo.What more proof do you need? And even though i like Buhari and feel at this time he is the best President we can have,it is behaviours like this that made me say he was a tribalist and always overlook the northerners.Remember the popular story in the 80s when Shehu Shagari was kept under house arrest while Vice President Alex Ekwueme was kept in jail? And so many governors and politicians were jailed while so many Northerners were left to continue with their lives and their millions.A particular case of suitcases coming into the country also comes to mind. Why is the Abacha family still regarded as honorable in Nigeria? 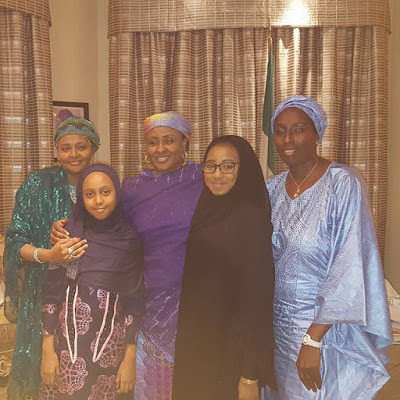 Imagine my annoyance when yesterday all i saw on so many Nigerian blogs and news outlets were pictures of Former Military president's daughter, Gumsu Sani Abacha and her daughters visiting the Aso Villa where they paid a visit to President Buhari's wife-Aisha Buhari and their daughters.! Why? Why Why Why?They should never be allowed to set foot into that building again,that family should be burying their heads in shame somewhere.I just don't understand it.I really don't.Maybe someone can enlighten me please.I understand it was not the daughters or family who perpetuated the crimes against Nigeria,but they all enjoyed the riches together and still do.Have you ever heard of Nigeria confiscating any of the Abacha's properties? This has only been done by foreigners.I just think the whole thing stinks frankly.